Congressman addresses island via Facebook Live - KUAM.com-KUAM News: On Air. Online. On Demand. 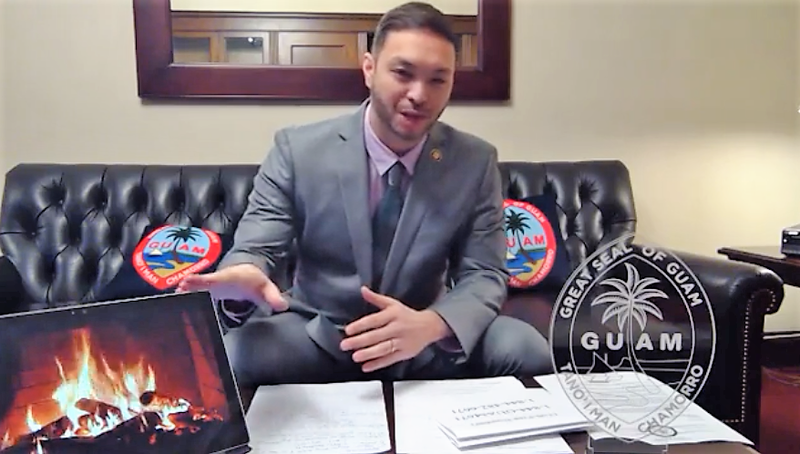 Announced initially as a press conference over Facebook Live to discuss breaking developments on the Guam War Claims Programs—instead, Congressman Michael San Nicolas called it his first Facebook Live event and right off the bat, he announced he wasn't taking questions. Did you feel all warm and fuzzy? "If you notice we have our fireplace here," San Nicolas said. Or left out in the cold? "We're not going to be responding to any facebook questions or comments directly in the Facebook Live," he said. No questions, no comments, no facebook, no problem. "We've established the first 24-hour congressional hotline, but we humbly ask that you reach out to those who might not be using this medium of communication and just update them," San Nicolas said. For about a half hour, via Facebook Live, the congressman provided an update on his efforts to address a multitude of issues concerning the territory. On the hot topic of war reparations, he announced that corrective legislation should be introduced by the end of the week to ensure claims are paid out. "At that point, we're going to start walking it through the process and updating the people of Guam on the progress with respect to the issue," San Nicolas said. "And so how can we really understand the gravity of the problem or when the problem started if we have no documentation about the problem we have no history of how long it's been there or how often it's been brought up 2106 or what has or has not been done to actually resolve the issue," he questioned. As for the removal of the Philippines as a country for the visa waiver program, the congressman said he's working with the Leon Guerrero-Tenorio Administration, the Asian Pacific American Caucus and engaging in dialogue with the Philippine Ambassador to the United States. "To be able to lean on and create pressure for a solution with respect to our H-2b circumstances," he said. He also announced he's co-sponsored legislation with Puerto Rico Congresswoman Jenniffer Gonzales-Colon to repeal the cockfighting ban but also conducting research regarding language contained in the Organic Act. "In a nutshell because cockfighting was passed into local law when there was a clause in the organic act that said that anything passed into local law automatically became organic unless congress vetoed it because that passed while that was still active," he said. "And there was no congressional action to actually repeal that out of the organic act as it should be in by default then there's an argument that even though the farm bill creates a ban on one side the organic act also creates an authorization on the other side." As for what's being done to open is district office, for now, you'll have to call his toll free 1-800 number. I apologize for the communications hiccups," San Nicolas said. "I really didn't I wasn't aware that it was going to be something that was so volatile." You can reach San Nicolas' office at 1-844-GUAM-671. You also can send your inquiries via email to michael.sannicolas@gmail.house.gov. The video of the fireplace was used, San Nicolas said, to continue the late Gov. Ricky Bordallo's tradition of his television fireside chats. San Nicolas said he, like the late governor, is using modern tools and the latest technology to communicate with constituents. The reason he wasn't taking comment or questions over Facebook—privacy concerns. "If we get a comment on the Facebook it might...we don't know who that particular profile is," he said. "And we want to make sure that if there's going to be any kind of privacy clearances that we need you to get you to sign off on in order for us to be able to follow through on your query we need to be able to reach you for exactly who you are and not based on your Facebook profile. So, comments and questions that come through the Facebook channel, please direct them to the website so that we can properly service you in a documented fashion." Reacting to Delegate San Nicolas' Facebook Live "fireside chat", veterans advocates Dan Mendiola and Fred Flores saying Facebook is modern, but some may prefer the old fashioned face-to-face sit downs. "I wasn't even aware there was a Facebook Live," Flores said. "There's maybe no substitute for a one-to-one," Mendiola said, adding, "The older generation had it right - you get more of a feel good feeling when they give it to you, that way you can hold them accountable - well you looked me in the eye and said this or you spoke to me and this is what you conveyed." While the two vets did say they prefer a face to face, both were grateful San Nicolas took time to check in after a rough month where he was largely seen as AWOL. "I believe I heard the issue where he was hard to get a hold of, but then again, he's newly-elected, so it's only fair to give him time to fix these deficiencies and then complain later," said Flores. It shed new light on this young man as to what he's doing for us on island - especially the veterans. Meanwhile, former senator Frank Blas Jr, head of the largest World War II survivors foundation on Guam, was less impressed. "It was a regurgitation of a number of things that continue to be issues," he said. With a peak of 110 viewers watching the San Nicolas livestream this morning, Blas raised the issue of information not reaching the stakeholders it affects and also the one-sided narrative San Nicolas offered by not taking questions. "If it's a conversation, conversation goes two ways," he sternly said.